The selenium test checks the selenium blood level. What is a selenium blood test? 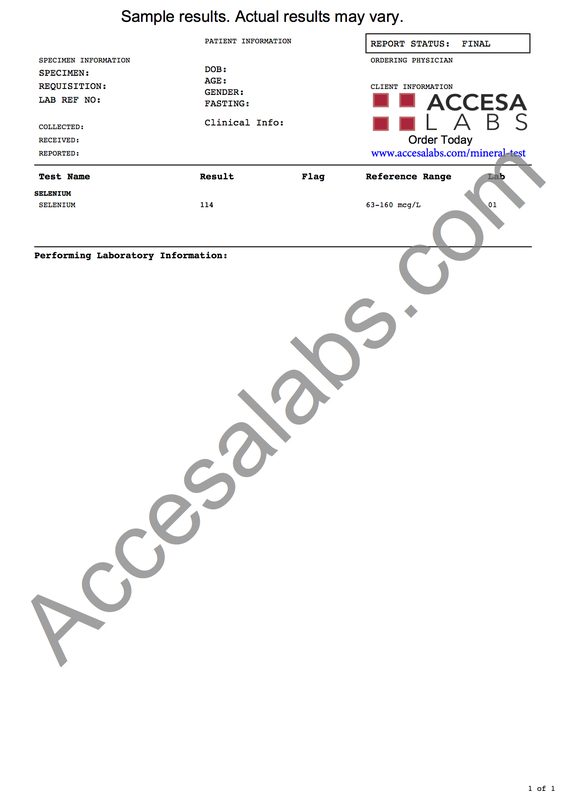 The selenium lab test measures the selenium blood level. Why is a selenium blood test important? The selenium test helps check for abnormal selenium levels. Do I need to prepare in any special way before a selenium level test? It is recommended that you refrain from taking supplements for at least 72 hours before a selenium blood test. This Selenium Test is a blood test. The selenium test, sometimes known as a selenium blood test, selenium lab test and selenium level test, measures the selenium blood level. Selenium is a mineral that plays a role in metabolic processes related to antioxidants and anti-aging. In excess, selenium can be toxic and cause a selenium poisoning condition known as selenosis. Symptoms of excessive selenium levels include hair and nail loss, fatigue, and a garlic odor but can progress into more severe illness and death. Low selenium levels, or selenium deficiency, can occur from poor absorption but is typically a rare condition. Some research is underway to see if low selenium blood levels have an impact on chronic medical conditions but no strong evidence has been identified yet. To get a selenium test near you, order online and get the blood test done at a Quest Diagnostics lab. Once the selenium lab report is ready, it will be available for electronic download. As can be seen on the sample selenium lab results above, selenium blood levels are reported as a number and can be compared against the reference range provided by the lab. Selenium Test at Guaranteed Prices.